Tryouts are over and Little League baseball and softball seasons are in full swing. Parks and ball fields across the city are busy. The cooler weather and moisture this spring has also been very welcome. April is a great time of year to get outside and enjoy the many activities available to residents of the City. The St. George Art Show is always a favorite activity for my wife. She also enjoys time spent in her garden or working in the yard. As for me, spring is the best time to spend some real quality time at the lake. The National Council for Home Safety and Security have released their rankings for the safest cities in Utah and ranked the Santa Clara/Ivins community as the fifth safest community in the state behind Smithfield, Lone Peak, Pleasant Grove and Sarasota Springs. Based on the ranking criteria, Santa Clara & Ivins is the safest community in Southern Utah. Some of the credit needs to go to Chief Bob Flowers and the dedicated personnel of the Santa Clara – Ivins Police Department. The department has done a great job since the two cities merged the police departments in July of 2012. However, a lot of the credit should be given to quality of people who live in the two communities as well. Despite rapid growth which has occurred in both communities in recent years, the quality of the people moving in and buying newly developed properties have maintained the high standards of the community. Statistics show growth has not resulted in an increase of violent crime nor property crime. Thanks to all residents of both communities for doing your part to help keep our community a safe and secure place to live. More information on the rankings is available at www.alarms.org/safest-cities-in-utah-2018/. The 2018 Princess Pageant is scheduled for 7:00 pm on April 14th at the new Kayenta Performing Arts Center in Ivins. Monica Bracken has assumed the role of the Princess Pageant Coordinator and is doing a great job. The new venue should offer a warmer setting for the pageant and allow the audience to be much closer to the contestants. The City website has more information availa-ble on the pageant. The City website is continuously being updated and we are working to make it easier for residents to stay informed about City department activities, upcoming events, agendas and scheduled public hearings with the planning commission and city council. Check it out at www.sccity.org. 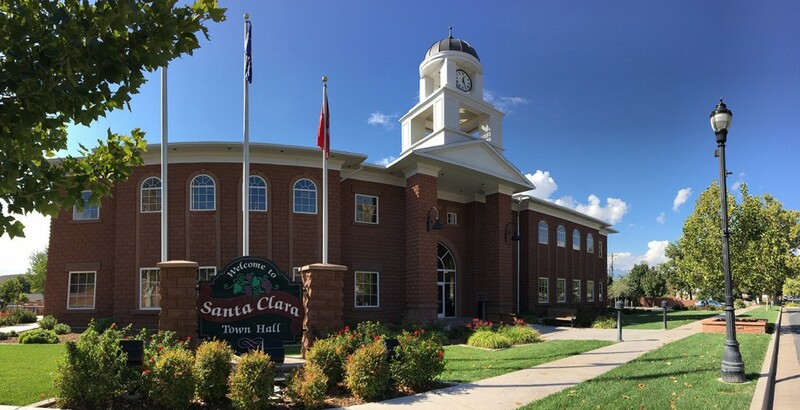 Applications for Santa Clara 2018 Recreation, Arts and Parks (RAP) Grants are due on April 30th. In FY 2017-18 the City Council awarded nearly $20,000 in Grants to support arts related develop-ment and activities including the Tuachan Center for the Arts and the Santa Clara Historical Socie-ty. Funds were also used to put the finishing touches on the Glockenspiel at Town Hall. Approxi-mately $18,000 in RAP funding is available for the Arts this year. Interested applicants need to have non-profit 501(c)(3) status and should contact the City for additional information. The county wide RAP tax also generates much needed funding for City Recreation Projects. This year RAP tax revenues are funding the new playground improvements at the Canyon View Park. Enjoy these spring days Santa Clara and remember to stay safe. We are pleased to announce the 2018 Miss Santa Clara Scholarship Pageant. We are extremely fortunate to be holding this year’s pageant at the Kayenta Performing Arts Center. Please join us April 14, 2018 at 7:00 pm to support all the amazing girls who have entered to participate. If you’re interested in volunteering or have questions please call the City Office at 435-673-6712 EXT 201. OR email the pageant director at monicabracken@gmail.com. Don’t forget to follow us on Instagram and Facebook at Santa Clara City Royalty. The 2018 Spring Burn Window is open March 1 – May 30. Always call Burn Control at 627-4949 the day you plan to burn. There is also a link for Burn Control on the city website at www.sccity.org. Click on the Public Safety drop down bar and select Fire Dept. and then Burn Window, you will then see a link for a Burn Permit. Burn days depend on weather conditions & clearing index. Fires must be attended to until completely extinguished. Make sure you have a hose or other extinguishing equipment at the burn site. Burning must take place during daylight hours only. The Spring cemetery clean up will begin Monday May 7th. All flowers, decorations, shepherds hooks, and other ornaments need to be removed from the cemetery before May 7. Remaining flowers and decorations will be removed by city personnel, with the exception of fresh burials. Flowers and decorations can be returned to the cemetery on Friday May 11th. The spring clean up ensures the cemetery will be clean and beautiful for May Mother’s Day and Memorial Day remembrances. The annual Kiwanis Easter Egg Hunt will be held on Saturday March 31, 2018 on the Spence Gunn Field at Can-yon View Park. The Easter Egg Hunt starts at 9:00 AM and is for children up to 8 years of age—the children are divided into age groups. Plan to bring your children to the park for this traditional Spring event full of fun, candy and prizes for the kids! With Spring upon us many of you are tackling those yard projects that have been looming over the winter. If your project requires any significant digging you will want to be sure to call Blue Stakes of Utah at least 48 business hours before you begin digging. This will allow time for utility providers to be notified to come locate and mark the utility lines on your property before digging begins. Be safe, call Blue Stakes first at 800-662-4111. And good luck tackling those yard projects! If you are interested in volunteering please call the city office at 673-6712 Ext 201. We hope there are some creative volunteers out there that will heed the call! The Washington County Solid Waste District will hold a House-hold Hazardous Waste Collection Day at the County Landfill on Saturday April 7, 2018 from 8 am-1 pm. Cost: Free for County residents dropping off household hazardous waste materials; there is a charge for tires. (Please call about commercial charg-es; 673-2813). Chemical products in your home are considered hazardous waste once they are no longer in use or are past expiration dates and may become more apt to ignitability and toxicity. Materials accepted include aerosol cans, car batteries, fluorescent light bulbs, fuel, herbicides, pesticides, paint and paint supplies, medical waste, oil, and propane. The Washing-ton County Landfill is located at 330 North Landfill Road in Washington, UT. If you would like to be on an email list to be notified of the collection date please send an email to wcsw01@gmail.com or see their website at wcsw.org. This is a great opportunity to clean out and get rid of those leftover, expired and no longer used chemical products in your home. Santa Clara and Arrowhead Elementary Schools will be holding Kindergarten Registration on Wednesday March 28 and Wednesday April 4, 2018 from 9:30—11:00am and 1:00—3:00pm both days. You will need to bring your child’s birth certificate and immunization records. For more information contact Santa Clara Elementary at 628-2624 and Arrowhead Elementary at 674-2027. Santa Clara Elementary is accepting applications for the 1st grade Chinese Dual Immersion Program for the 2018-2019 school year-call 628-2624. If you have a student that will be attending Lava Ridge Intermediate School next year you will need to contact the school office at 435-625-4247 for registration information. Arbor Day is coming soon! Saturday April 14th from 9:00 AM to 1:00 PM! Come help us show appreciation for trees with a tree planting; also we will have a drawing for a Tree gift certificate from Star Nursery! (Valued at $50.00) Free Kites will be given to the first 100 people joining us! You can color and fly them to fill the sky with your beautiful art! Ed Kinder from Riverton Utah will be bringing a collection of his kites and will be doing demonstrations. We will also have games, crafts, popcorn, cot-ton candy and a free hotdog lunch at noon! For volunteer or other information contact Sherrelle at 435-673-6712 x219. This will be a great fun family event! Hope to see you there! A new paved trail is going to be built from Gubler Park to the Lava Flow Trail near Red Mountain and Pioneer Drives. The trail will follow the wash behind Harmon’s Grocery Store and include a 90’ pedestrian bridge across Tuacahn Wash. The new trail will connect 2 existing trails that will allow travel by trail from 400 East at the Ivins City Limit to the Sand Hollow Aquatic Center and the Santa Clara Historic District. For questions, please contact Brad Hays at bhays@sccity.org. The Canyon View Park playground has been a family favorite for over 20 years, but unfortunately we recently had to remove the upper slide and staircase due to unsafe cracks. The play-ground is safe but is lacking several original features. Replacement parts are no longer available so the City plans to replace the playground using RAP Tax Revenue. If you are interested in participating in the playground design and selection, please contact Sherrelle Pontarelli, Parks Administrative Assistant, spontarelli@sccity.org or 435-672-6712 extension 219. The Gubler Park west parking lot has been paved and striped. The Jacob Drive entrance will be closed until other construction is completed. Please use the Tuscany Drive entrance to access the Pickle Ball Court area. The Ivins Animal Shelter welcomes new Animal Control Officer and Shelter Manager, Bailee Sleppy. She came to us from Mesquite and is very excited to continue her Animal Control career with the Santa Clara-Ivins Public Safety Department. Bailee comes from a horse and rodeo family and rides and trains horses when not working. Please watch for shelter news from Bailee in future newsletters. In the meantime with spring upon us we would like to remind all pet owners to remember to keep your dogs on a leash when out walking them and to respect others property along the way by cleaning up after your pet. Also, as the weather gets warmer please remember not to leave your pet in your car where temperatures can climb quickly. Be sure to provide plenty of water and shade for your pets as well as the weather warms up. Have a safe and fun spring with your pets! Spring has arrived! The season of renewal, budding trees, Spring flowers, and hopefully rain. This month Art in Kayenta will host the Chalk street painting festival April 28th and 29th. INKAS will have their table by Xetava restaurant. We’ll have items for sale for pets, pet parents and friends. All proceeds go towards helping homeless animals and the Ivins No Kill shelter along with projects that help the animals. Please come out and have a fun day supporting the Arts and INKAS (Ivins no kill animal supporters). One bit of news to pass on: INKAS has decided not to hold a Spring yard sale. With Spring weather so unpredictable and usually very warm (last year 104) We will only have the fall yard sale in October. But please don’t let that stop you from your Spring cleaning for donations! INKAS always welcomes the odds and ends no longer needed or used. We offer pick up services! Or call to drop off donations. All of us in INKAS thank you for your continuing support.